Well, after a little bit of website trouble, we’re back and ready to report some good news. For you Cliq XT fans, a few more days of waiting will cost you less than previously thought. The first of the month showed us a leaked price sheet that put the Cliq XT at $129.99 and, as it turns out, the actual price on a 2-year contract will be $99.99. No word on pricing for Even More Plus customers. As we last heard, it was $329.99 so we’ll be sticking with that until we hear differently. Judging by the feature set and with the probability of a future Android OS update, $99.99 is a steal for the Cliq XT. In our eyes, $99.99 is a sweet spot and should bring some nice sales numbers. Of course, you can always get two. Want a good long look at the Cliq XT? Take a look at Noah from Phonedogs unboxing video! I’ll buy it if I can put Windows Mobile 6.5 on it! 1yr agreement???? I thought T-Mobile doesn’t have 1 yr agreements anymore. You can’t get them in retail locations. They are usually only for business accounts. 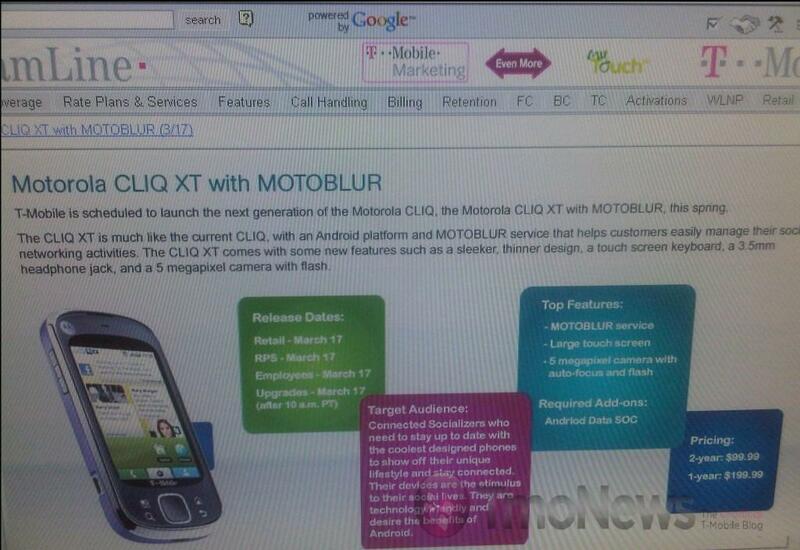 So who would want the Cliq XT for business? The tageted audience is: Connected Socialites who need to stay up to date with the coolest designed phones to share their unique lifestyle and stay connected. This does not sound like it is tageted to businesses. I am tempted to get one for a back up for my nexus one which seems I have to send to HTC to get fixed a few days after I get replacement after replacement and HTC customer service really is a black eye on my android experience. This is the only android device T-mo is getting for now? This the same phone as the original cliq with a new body and no keyboard! Ok, so its getting one or two things the original didn’t have. Whipdy dew! I played with one at my local T-Mo store and to be it seemed laggy. But then again that was right after playing with the HD2. Edit ** to ME it seemed laggy. Whoa, whoa, whoa…if the leaked price on this was wrong, could that $449 for the HD2 be wrong as well? No, the HD2 price is correct. The original is FAR too laggy. I hate it! I got it and I love it. It did come up at $99 with the tax, I ended up paying $128. I picked this up @ Walmart for only $48.88 on a 2yr/contract and it being my first smartphone, I’ve been really pleased as to how it performs and is quick and responsive….can’t wait to see what the upcoming 2.1 update will do for the phone.